Two of my favorite foods are eggs and avocados. It makes perfect sense to combine the two in one great dish. 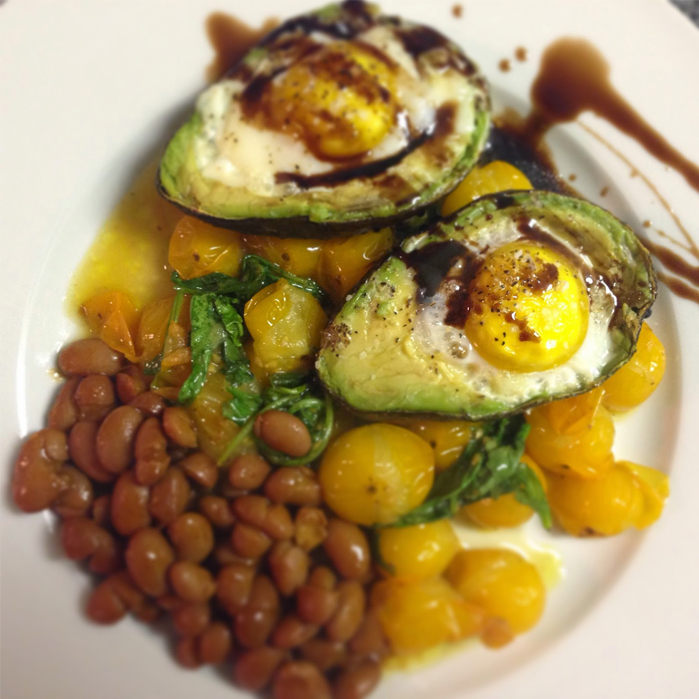 This recipe is full of healthy fats and works well for breakfast or dinner. Our Pastamore Traditional Barrel-Aged Balsamic Vinegar finishes off this awesome dish with a nice touch of acid to cut through the richness. To avoid a mess be careful that the avocados are big enough or that the eggs are small enough that they fit into the scooped out avocado. 2. Slice avocados in half and dispose of seeds. Scoop out approximately 1/4-1/3 of the center of the avocado flesh (more if the eggs are large). Place the avocados on a baking pan. It is easiest to use foil surrounding each avocado half to keep it level. 3. Carefully break an egg into a small dish or container. Pour the egg into one of the avocado halves. Repeat with remaining 3 avocados. Season with salt and black pepper. 4. Cook for 10-15 minutes or until egg whites have set. 5. Plate and finish with a drizzle of Pastamore Traditional Barrel-Aged Balsamic Vinegar.